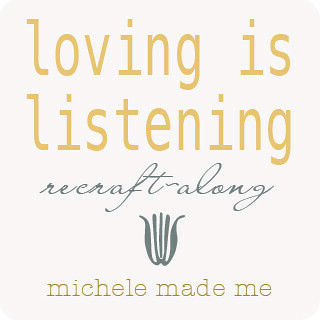 In case you missed it, on Saturday I introduced the “Loving is Listening ReCraft-Along”. That intro is here for your perusal, btw. Now that the idea is out there, I’m most anxious to hit the ground running. If you have any questions big or small, do leave them in the comments okay? And remember that I will be answering recraft-along questions in the comments so readers can share them equally. So today we will (1) list the tools and materials you’ll need for the recraft-along, (2) prepare the base, and (3) create the branch element. You ready? Let’s do this! If you’ll be decorating a large cereal box, as I am, you’ll need a large cereal box for the base. I’m using a 525 g box of Cheerios. Note: The “Loving is Listening” Design is for personal use only. Please do not make items for sale from this design. Thanks! In Saturday’s post I suggested a few ways in which to use the “Loving Is Listening” design. For the purposes of this recraft-along I will be focussing on decorating a cereal box. 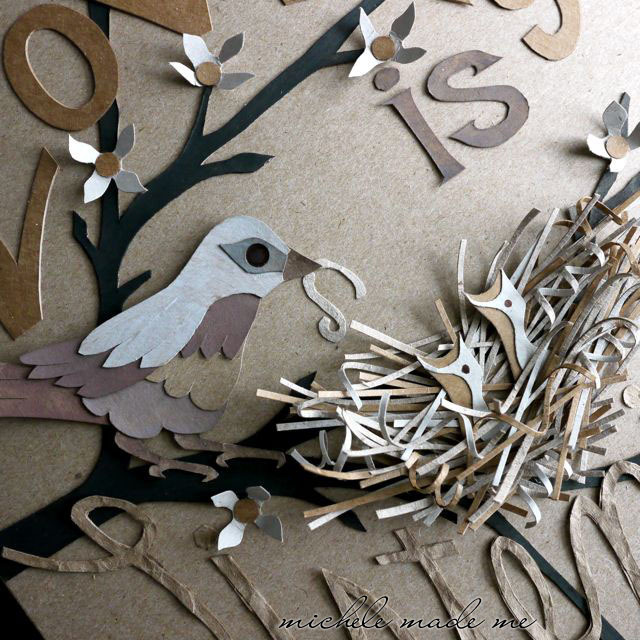 But do feel free to frame your finished piece, or make a gift box, or whatever tickles your little fancy! Prepare The BaseFor my base, I’ll be using a large family size cereal box. If it helps, this one contained 525g (~18oz) of cereal. Let’s start by removing the top edge of the box and turning the whole thing inside out. Step 1: With your fingers, carefully pry open the box at the seam and flatten it out. With a ruler and pencil, mark a line 5 cm (2 inches) from the top of the box. Cut off the top of the box at the line with a utility knife. Step 2: Now simply re-fold the box so that the lovely neutral inner surface is now on the outside. I apply glue to the narrow side flap and bottom flaps. At this point, I use a few pieces of masking tape to clamp the gluey flaps temporarily in place until the glue dries. Note that I don’t fully flatten out the bits of masking tape. I leave the corners of the tape curling up so that it’s easy to take off again. Once the glue is set, I remove the masking tape slowly to avoid lifting and marring the surface of the cardboard. We’ll now take out a paper bag and use it to finish the top inner surface of the box. Step 3: Grab your paper bag. Cut off the bag bottom and cut it open along the seam. Step 4: Scrunch up the bag several times. Do this carefully so as not to rip it. Scrunch and re-scrunch until it is evenly wrinkled throughout. Step 5: Press your paper flat with a dry iron. Step 6: Cut out a few wide strips from your paper. My strips are 3 inches wide but you could go wider if you like. You’ll need enough length to go around the inner top edge of the box. 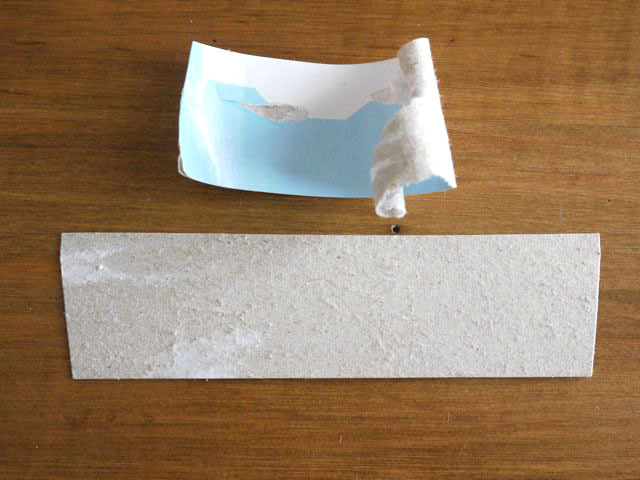 Step 7: Apply glue to the entire outer edge of the paper strip. Step 8: Place the gluey strip flush with the inner top edge of your box. Flatten and pinch the strip in place along the edge making sure it is adhering nicely all the way around. Beauty. The box is now ready to decorate! Note: If you happen to be turning this into a gift box, HERE is a post that suggests some creative ideas for nifty handles. Now would be the optimal time to install handles, by the way. Step 9: Use the link provided in the “tools and materials” list to download a copy of the Branches Template. Print it out. 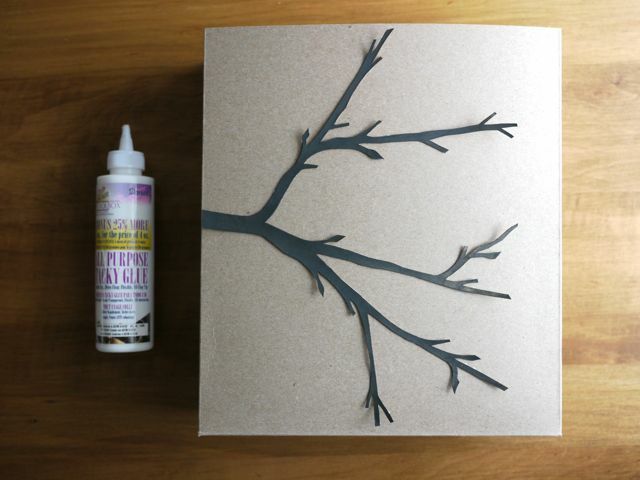 Use a sheet of carbon paper to transfer the branch design to the inside of one of your larger cereal boxes. Step 10: Cut out the branch. I used both a utility knife and pair of scissors to cut my branch out. Fine details are more easily handled with a utility or craft knife. Step 11: Paint the branch. I used The Boy’s black cake paint on my branch. Yes, I asked permission. Allow the paint to dry. If your branch curls, place it under a heavy book for a while to flatten it out again. Step 12: I peel off most of that silly layer of shiny paper and then I apply the glue to my branch. See? Step 13: And finally (for today), I attach the branch to the box and stick a light book on top to make sure it is super-glued on there. Nope, that baby ain’t goin’ nowhere. Oh and by the way, if you happen to take any process photos, feel free to share them in the dedicated “Loving is Listening Flickr Group“, yes sir. And lastly there’s new “Loving is Listening Button” down in the sidebar there for ya, in case you’re joining along! Next up: Taking a break for an extremely lovely “You Guest It” on Thursday. I’ll be back on Saturday with the next installment of the “Loving is Listening ReCraft-Along”. Until then, you have a great week!